I made this for my son's birthday party and everyone fell in love with it! 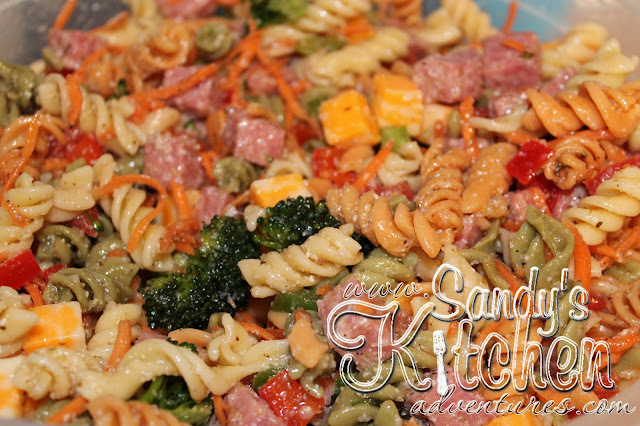 This will definitely be my "go to" pasta salad for any get together from now on. The dressing is what makes this dish taste so wonderful. It was even better the next day! It is definitely a keeper! Enjoy! Mix the ingredients for the dressing together until combined and sugar is dissolved. Set aside. Cook pasta according to directions on the box. Drain and set aside. In a large bowl, combine, pasta, salami, veggies and dressing. Chill well. Add parmesan cheese and cubed cheese before serving. This helps to prevent the cubed cheese from getting soggy.